It was 1974, and I was a new teacher of English language learners, fresh from graduate school with three years’ experience in the Peace Corps in West Africa. The newsletter that impressed me was a product of the International Club a few years earlier. It contained international news, exquisite drawings, and short explanations about different customs in countries represented by students in the club. It was impressive but seemed not something I could do. As the years passed I gained experience and confidence in my teaching and from time to time toyed with the possibility of producing a newsletter just like the one in the back of my file cabinet. But it was an idea that was easy to push aside. I didn’t know how to do it, and I didn’t think my students wrote well enough to produce a school publication. In the mid-1980s, however, I was beginning to run out of excuses. In 1984 Maryland implemented a writing test that was required for graduation—a test that my English language learners were actually passing. When many of my students said, after passing the test, that they didn’t need to write anymore, I knew I needed to give them a real purpose for writing. I wanted students to know that we don’t write simply to pass a test. We write because we have something to tell people. As I learned more about the process of writing, I began to believe that my students really would be able to produce the kind of writing that others in the school would like to read. For the past nineteen years Silver International has grown and flourished as a publication for English language learners in our school and many other schools around the world that subscribe to it. It’s called a newspaper, but there is not much news in it. Yes, there are a few articles about things happening in our school and other schools, but there are also a lot of essays, poems, drawings, personal messages, and letters written by English language learners—students who rarely have the opportunity to see their written work in print. Writers enjoy sharing their personal stories full of pain and hope. Readers love skimming the paper looking for something about their country or an article written by a friend. 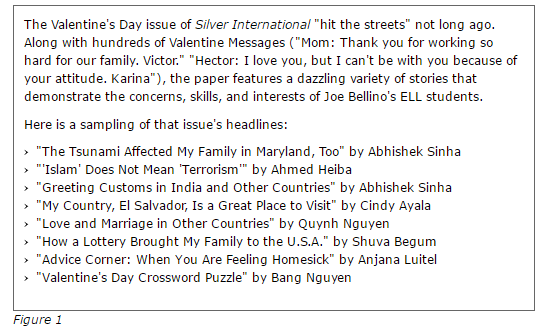 Originally intended for our school’s English language learners only, the paper now has a circulation of 4,200 copies. It is distributed to 3,500 students and staff in my high school, Montgomery Blair High School in Silver Spring, Maryland, and is mailed to more than 700 students, teachers, parents, and friends around the world. A number of teachers in other schools have class subscriptions and submit their own students’ writing for publication. When the paper finally came out, and he saw how his story completely filled one page, it was the first time I saw him smile. Miguel was a different student after that. People knew Miguel and they knew Miguel’s story. Vichea had recently come to the United States from Cambodia and was in a high beginning English class for nonnative English speakers. I knew that Vichea also had a story, a story I only knew small bits of, but one that the school needed to know as well. Since I didn’t think his English was developed enough to write the story himself for Silver International, and since the paper did not at that time have skilled reporters who wrote about others, I talked to the advisor of the main school newspaper and suggested they do a story about Vichea. A few days later Vichea came to me. “Mr. Bellino, why didn’t you ask me to write my own story?” he asked. About a month later, Vichea handed me his story. As I skimmed through it, I was surprised at how good it looked. There were a lot of grammatical errors, but it had periods and paragraphs, and, most surprisingly, he had used dialogue correctly. I knew this was not something he had been taught in his high beginning ELL class. “Who helped you with this?” I asked. That evening I read Vichea’s story more closely and noticed amazing similarities with Miguel’s story. I could not help but wonder if he had taken sections from it as his own. Both stories took place in villages that were attacked by rebels. Both writers were held at gunpoint by boys they knew from their schools. Both engaged their captors in dialogue and questioned the usefulness of their captors’ actions. I was not aware of the therapeutic value of the paper for children of war and other traumatic experiences. Miguel’s story was one example, but there are many others by students who found relief knowing that others knew some of the terrible things they had experienced. Students have also written about living through hurricanes and earthquakes and have told stories of personal tragedies. Students who write these stories often comment on how much they appreciate the positive reactions they receive from teachers and classmates. I did not think that articles students wrote would actually effect change in the school. However, after our second issue I realized that the paper has tremendous power. As the head of the English language learners’ program in our school, I was concerned about the low grades the students were getting in science. I had talked with the head of the science department and suggested they have additional sheltered science classes, classes designed for the English language learners that would make the subject more accessible to the students. “We can’t do that,” he said. “We don’t have enough teachers for the smaller classes it would require, and no one wants to teach them.” I tried to offer suggestions, but they had little effect. I was not thinking how much getting published in a newspaper would give students positive feelings about themselves and their lives in this country. One day after school I was paged over the intercom to go to the office to take a phone call from a teacher in Arizona. As I walked to the office, I wondered what the teacher would be calling about. She had had a subscription to the paper for a number of years, and we had communicated in letters, but we rarely spoke on the phone. “I had to call you,” she said, “to tell you an amazing thing that just happened.” She started to tell me about one of her students whom she referred to as a “do nothing.” He would come to school but rarely completed assignments. However, she had noticed that he was starting to do his work after a poem he had written was published in Silver International. View the Silver International archive online.